Mole, vole or shrew: ever wonder what the difference is between these pests, or why you should care? All three of these mouse-like creatures may be seen in or around your garden. Identification is important in determining if and how you should control these critters. Identification: A mature mole will grow 5-7 inches from snout to tail. Moles have soft, thick, velvety-gray fur, a long, blunt snout and an approximately 1-inch long tail. Their eyes and ears are inconspicuous, hidden under their fur. Their paddle-like front paws are two to three times wider then their rear paws. 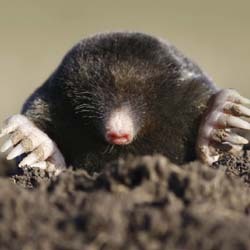 Damage: Moles, in search of grubs, beetles and earthworms, burrow in the ground and create tunneling in the lawn and garden. They surface occasionally leaving small hills of loose soil. Moles are solitary, subterranean creatures. Control: Reduce food supply by controlling grubs in the lawn. Use repellents containing castor oil, or toxic baits placed in the tunnel but out of reach of pets. There are several different styles of mole traps available on the market. 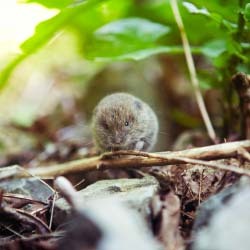 Identification: Voles, often called meadow mice, are a little larger than moles reaching 5-8 inches long at maturity. Their heads are rounded, their eyes are larger than shrews, their fur is brown, short and smooth, their front paws are about the same width as their rear paws and their tails are about 1 ¾ inches long. Damage: Voles are herbivores that feed on bulbs, tubers and tender young plants. During the winter, often under the cover of snow, voles will eat surface roots and chew bark from the base of trees and shrubs often causing the plant to girdle and die. Voles, unlike moles and shrews, are social and where you find one, you will find many. Voles will often tunnel in mulch or ground cover above ground leaving surface trails. They sometimes run through old mole tunnels eating plant roots. Control: Use Thiram-based repellents. Set up mouse traps baited with peanut butter or apple slices. Keep mulch away from tree trunks. Remove snow from the base of trees and shrubs in the winter. Protect young trees by wrapping the lower trunk in wire mesh. Apply predator urine to the area and reapply frequently. Do not use poisons. 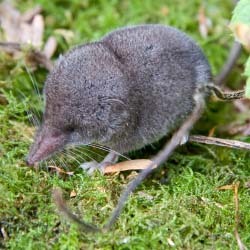 Identification: A mature shrew will reach 4-5 inches long. Shrews have a thin tail about 7/8 of an inch long, soft, grey, short fur, small beady eyes, small ears and a pointed snout. Damage: Shrews, like moles, are insectivores. They eat earthworms, grubs and other insects. Shrews, however, are often seen above ground although they tend to use old mole and vole tunnels to get around. Shrews cause no real damage to plants and eat a variety of insects making them beneficial in the landscape and garden. Not sure what to do about these pesky garden visitors? Stop by to see our complete line of safe, effective pest control products and to ask for expert consultation about which visitors should be welcome in your garden and which ones you should gently encourage to leave.